Montair 4 Chewable Tablet : Each tablet contains Montelukast Sodium INN equivalent to Montelukast 4 mg.
Montair 5 Chewable Tablet : Each tablet contains Montelukast Sodium INN equivalent to Montelukast 5 mg.
Montair 10 Tablet : Each tablet contains Montelukast Sodium INN equivalent to Montelukast 10 mg.
Montelukast is a selective and orally active leukotriene receptor antagonist that inhibits the cysteinyl leukotriene CysLT1 receptor. Cysteinyl leukotrienes and leukotriene receptor occupation have been correlated with the pathophysiology of asthma ( such as, airway edema, smooth muscle contraction and altered cellular activity associated with the inflammatory process, which contribute to the signs and symptoms of asthma). 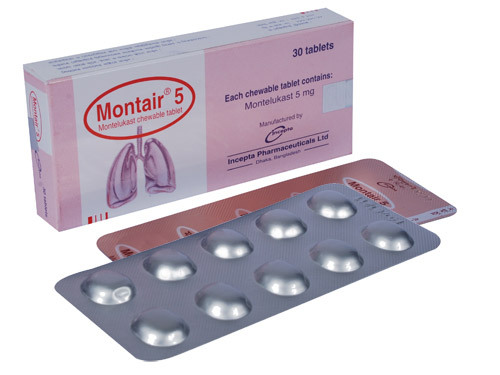 Montelukast is indicated for the prophylaxis and chronic treatment of asthma in adults and pediatric patients from 6 months of age and older. Adults (15 years of age or over): 10 mg daily to be taken in the evening. Children (6-14 years of age): 5 mg daily to be taken in the evening. Children (6 months-5 years of age): 4 mg daily to be taken in the evening. Safety and effectiveness of Montelukast in pediatric patients younger than two years of age have not been established. The safety and efficacy of Montelukast was demonstrated in clinical trials where it was administered in the evening without regard to the time of food ingestion. 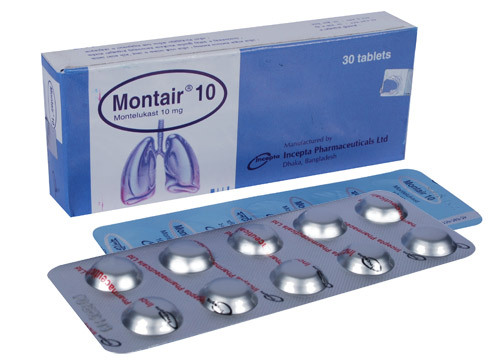 Generally, Montelukast is well-tolerated. Side effects include dizziness, headache, diarrhea, restlessness, abdominal pain, cough, fever, asthenia, rash and upper respiratory tract infection. 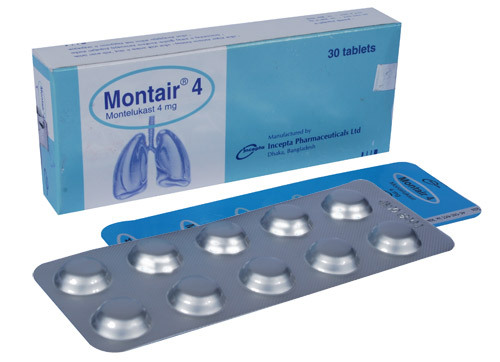 Montelukast is not indicated for use in the reversal of bronchospasm in acute asthma attacks (in case of status asthmaticus). Patients with known aspirin sensitivity should continue avoidance of aspirin or other NSAID, while taking Montelukast. In rare cases, patients on therapy with Montelukast may present with systemic eosinophilia, sometimes presenting with clinical features of vasculitis consistent with churg-strauss syndrome, a condition which is often treated with systemic corticosteroid therapy. Physician should be alert to eosinophilia, vasculitic rash, worsening pulmonary symptoms, cardiac complications, and/or neuropathy presenting in their patients. A causal association between Montelukast and these underlying conditions has not been established. Pregnancy: There are no adequate and well-controlled studies of Montelukast in pregnant women. Because animal reproductive studies are not always predictive of human response, so Montelukast should be used during pregnancy only if clearly needed. Lactation: It is not known if Montelukast is excreted in human milk. Because many drugs are excreted in human milk, so caution should be exercised when Montelukast is given to a nursing mother.